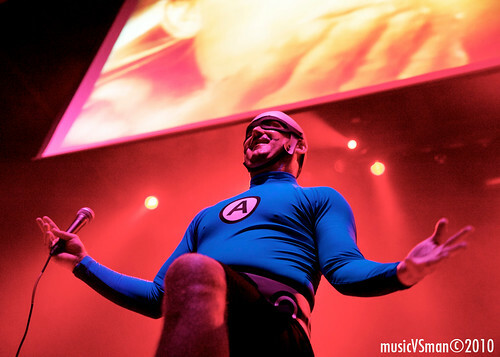 Defending the world from evildoers through music isn’t an easy task, but thankfully The Aquabats make the fight a fun one. 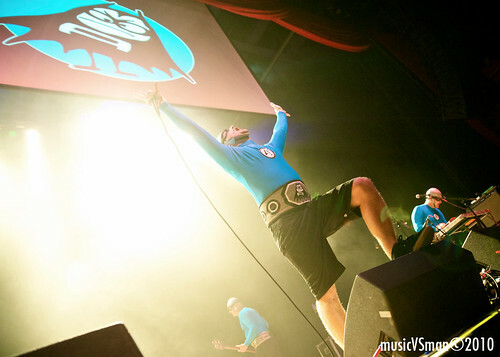 Armed with their hyper surf/punk ska blends and matching superhero costumes, the Orange County band (led by MC Bat Commander) did their part in keeping a smile on everyone’s faces at The Pageant. -Random cartoon and TV clips played above the band during the entire set, but the angle from the photo pit made it difficult to simultaneously watch both that and the band. For those out in the crowd, did the footage enhance or distract from the experience? -Maybe because their style is so hyper, I admit that I felt a little worn down midway through the set and there was a down period towards the latter half that was punctuated with some talks to the crowd that went on a little too long. It felt something akin to coming down from a sugar high. Fortunately, the set ended on a really high note with the kids stage diving. -Ok, let’s talk about that whole kid stage-diving thing. 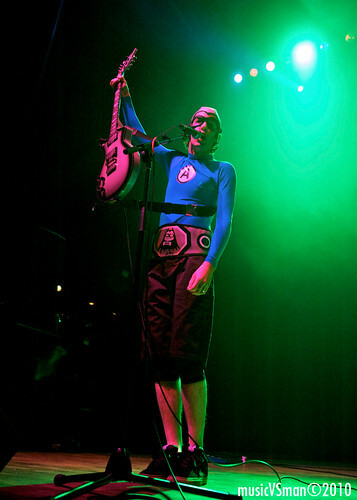 Towards the end of the set, the band brought up a few kids dressed up in their Aquabat costumes and (with their parents’ permission) proceeded to give them their first crowd surfing experience. One by one, MC Bat Commander picked them up and tossed them into the crowd. Part of me thought it was really cute (especially one instance where the dad jumped in first and then caught his kid), but I’ll be honest and say that I was nervous with each kid thrown (especially the youngest kid, about 6?). Granted, I’m pretty risk-adverse, so take that into consideration. Thankfully everyone was safe and everyone had fun. 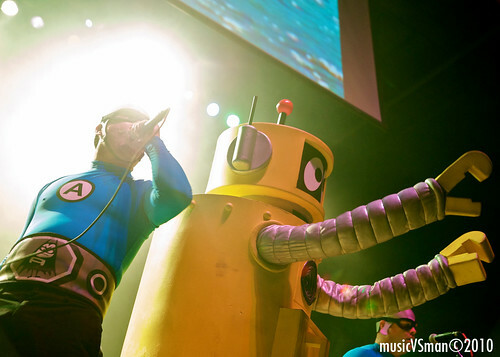 -Plex the Robot from Yo Gabba Gabba (of which MC Bat Commander a.k.a. 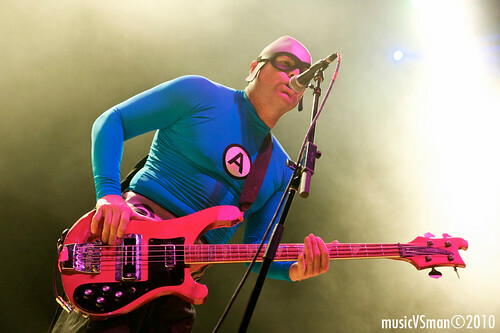 Christian Jacobs is a co-creator of) joined the Aquabats towards the end of the set. 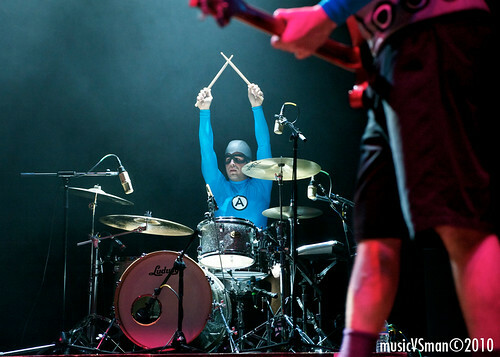 And if that wasn’t enough, MC Bat Commander ended the set by doing two backflips off of the drum set. Crazy.